I have been a sucker for salads since about 3 months ago. I discovered the joy of eating them with my own homemade vinaigrette, rather than those bottled ones which can taste strange. 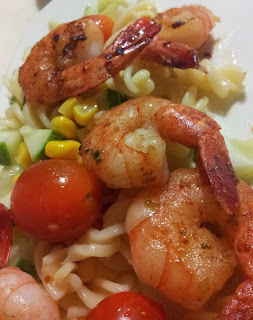 Below is the recipe for my grilled shrimps with pasta salad which I made to go with my steak. Simple and healthy! 1) Cook the fusilli in boiling water with salt and put it aside to cool down. After sieving the water out, quickly wash it with running cold water so as to stop it from overcooking the pasta. 5) I grilled my shrimps with my homemade garlic butter with herbs. I will teach you how to do it another time. If you dont have, you can just fry with minced garlic, put in some herbs or just season with salt. 6) Finally, assemble everything. Pour the dressing on top of the salad and mix it evenly. Then top it with the grilled shrimps. 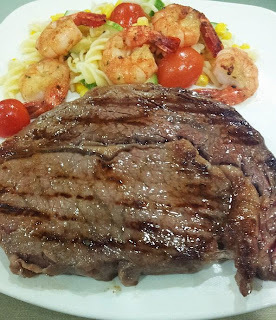 This dish is great on its own for lunch or even as a side!